Warning: This post is a celebration of how data analysis can help us understand how to optimise our nutrition to suit different goals. It may contain novel ideas based on large amounts of data. I was flattered when Chris Green (@heuristics) recently posted a graphical presentation of the food insulin index and my nutrient density data analysis using Tableau. 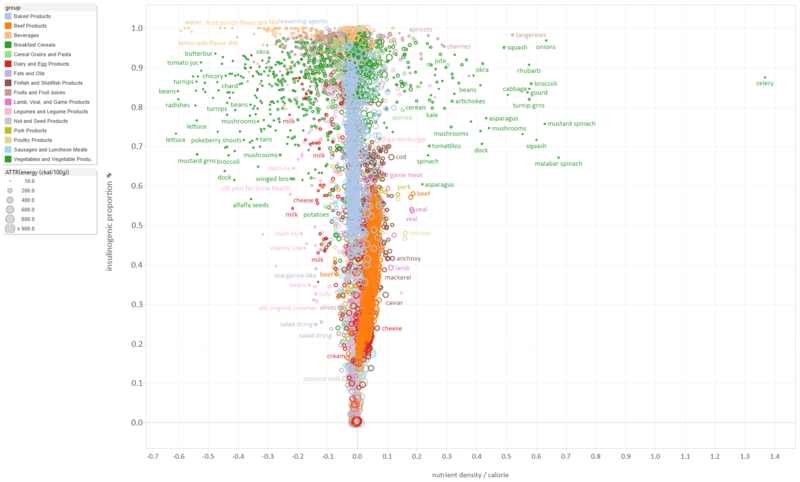 If you click on the image below you can see where the different foods sit on the plot of nutrient density versus proportion of insulinogenic calories or click on individual data points to learn more about a particular food and find out why it ranks well or poorly. I think presenting the data in an interactive format using Tableau makes large amounts of data more accessible compared to a static chart or spreadsheet that can be produced in Excel. Inspired by Chris’s chart, I uploaded the Food Insulin Index data for 147 foods from Kirstine Bell’s thesis Clinical Application of the Food Insulin Index to Diabetes Mellitus. Click on the chart below to see a larger version or, better yet, open the interactive Tableau version here. Click on the different tabs to see how your insulin response relates to different parameters such as carbohydrates, fat, protein, glycemic index, glycemic load and sugar. I think the food insulin index data is exciting because it helps us better understand what drives blood glucose, insulin, Hyperinsulinemia, metabolic syndrome, and the diseases of western civilisation that are sending us to an early grave and bankrupting our western economy. trends, outliers, insulin and protein. I think being able to better understand our insulin response to food is exciting for people with Type 1 diabetes (like my wife) to more accurately calculate their insulin dose or people trying to achieve therapeutic ketosis for the treatment of epilepsy or cancer. Understanding exactly how fibre and protein affect insulin and glucose demonstrates quantitatively why a low carbohydrate moderate protein approach works so well for people who are insulin resistant. While lots of people have found the food insulin index data useful, I want to highlight in this article that insulin load is only one factor that should be considered. Someone using therapeutic ketogenic approach to battle epilepsy or cancer will want to minimise the insulin load of their diet by eating very high amounts of fat, fasting, and perhaps supplementing with MCTs or exogenous ketones. Someone pursuing therapeutic ketosis will need to pay particular attention to making sure they obtain adequate nutrition within their very small insulin budget. For a type 2 diabetic who struggles to produce enough insulin to maintain their blood glucose within normal ranges, a lower carb moderate insulin load diet will help their pancreas to keep up and achieve normal blood glucose levels while minimising fat storage. People using a ketogenic approach for weight loss need to keep in mind that reduced insulin levels and ketosis occur due to a lack of glucose and not higher levels of dietary fat. If your primary goal is weight loss, fat on the plate (or in the coffee cup) should be just enough to stop you from going insane with hunger. Too much dietary fat will mean that there will be no need to mobilise fat from the body. Athletes and people who are metabolically healthy can be more flexible in their choice of energy source and perhaps focus more on more nutrient dense foods as well as energy dense foods. Humans are great at thinking in absolutes (good/bad; black/white) while ignoring context. We all like to grab hold of our favourite bit of the elephant of metabolic health and hold on tight. While many people suffer from hyperinsulinemia and its vast array of associated health consequences we need to remember that insulin is critical to life and growth and is required to metabolise protein for muscle growth/repair as well as all the other important functions of amino acids (neurotransmitters etc). Ideally, we should make every bite count if we want to maximise health and longevity. Every calorie should contain the maximum amount of nutrients possible. In a similar way, every unit of insulin that we “invest” should be associated with the maximum amount of nutrition (think of the nutrient density of spinach or liver versus than nutrient a soft drink or white bread). So let’s look at how we can “leverage” our “insulin investment” to maximise our health outcome. In this article, I’m going to risk overloading, overwhelming, and confusing you, the reader, with too much data. But at the same time, with all the data available you won’t have to take my word for it. You can make your own conclusions. If the idea is far out, you need to see the data. All the data. Not the hazard ratio, not just the conclusions from the computer. My new grand principle of doing science: habeas corpus datorum, let’s see the body of the data. If the conclusion is non-intuitive and goes against previous work or common sense, then the data must be strong and all of it must be clearly presented. So, how should you read a scientific paper? I usually want to see the pictures first. I am trying to draw conclusions from more than 6000 foods in the USDA foods database. These are hard to present accurately in single charts, so I’ve used a few. If something that you see doesn’t make sense at first you can drill down into the data to check out the detailed description. I have also included as much micronutrient and macro nutrient as I can. Just ‘mouse over’ a data point that you’re interested in to see how it compares to another data point. In the sections below I have given an overview of different ways to look at nutrient density with a more detailed discussion in the appendices at the end of this article. Unfortunately, this post is probably not going to work well on your phone. You’ll need to view it on a big screen for best effect. Lots of people talk about nutrient density, however, most of the time this is in relation to a few favourite nutrient(s) rather than a broad range spectrum of essential vitamins, minerals, amino acids and fatty acids. We hear that butter is high in Vitamin K2 and Vitamin D and hence we should eat more of it or that whey protein is high in essential amino acids (e.g. leucine and lysine) and therefore everyone should be buying tubs of it. A lot of time these claims are used to advertise a product or to argue a particular philosophical position (e.g. zero carb, vegan, plant based, paleo etc). The problem here is that many of these so call ‘nutrient dense superfoods’ do not contain a well-rounded range of the nutrients that are required for health, but rather a narrow slice of nutrients. Paleo, Just Eat Real Foods or ‘plant based’ is a good start, however I think there are some foods that are more useful than others. As detailed in the Building a Better Nutrient Density Index article there are also some nutrients that are harder to obtain in adequate quantities. Once we identify the nutrients that are harder to obtain we can focus on the foods that contain the highest amounts of these nutrients. At the same time, it is also useful to think about nutrient density in the context of specific goals, whether that be therapeutic ketosis, weight loss, diabetes or optimal athletic performance. The more I try to get my head around what it means to optimise nutrition, the more important nutrient density seems to be. The irony is that many people retreat from insulin to the safe haven of high-fat diets that don’t actually have the micro nutrients required to optimally power mitochondria, the power plants of our bodies. Like most things, we need to find the right balance. Most people now seem to understand that hammering high blood glucose with more insulin is dumb because the problem is insulin resistance and poor glucose disposal, not high blood glucose. But then the next question is what causes insulin resistance? It seems to me that part of the answer is sluggish mitochondrial that aren’t running at optimal efficiency to burn off the energy we throw at them. Part of the reason for this is that we’re not powering them with the right nutrients. To produce ATP efficiently, the mitochondria need particular things. Glucose or ketone bodies from fat and oxygen are primary. Your mitochondria can limp along, producing a few ATP on only these three things, but to really do the job right and produce the most ATP, your mitochondria also need thiamine, riboflavin, niacin, pantothenic acid, minerals (especially sulfur, zinc, magnesium, iron and manganese) and antioxidants. Mitochondria also need plenty of L-carnitine, alpha-lipoic acid, creatine, and ubiquinone (also called coenzyme Q) for peak efficiency. This video gives an excellent overview of the role that nutrients play to drive the Krebs cycle to enable our mitochondria to produce ATP, the energy currency of our cells. We can then moderate that using insulin load to work within the limits of your current metabolic health (i.e. insulin resistance, muscle mass, activity levels, pancreatic function etc). You need to eat to maintain the blood glucose levels of a metabolically healthy person. The plot below shows nutrient density versus proportion of insulinogenic calories. The size of the data points is proportional to the energy density of the foods they represent (e.g. the size of the markers for celery with a low energy density are smaller than for butter which has a high energy density). There is a lot of data here! You can click on the image below to see a larger version of the chart or better yet look at the interactive online Tableau version (which I think is pretty cool!). If you ‘mouse over’ the foods that you’re interested in you can see more details of the foods from the USDA food nutrient database. Click through the various tabs to see how things look for specific food groups. The x-axis on these charts is nutrient density/calorie. You can find out more about how this is calculated in the Building a better nutrient density index article. Essentially zero is average (or zero standard deviations from the mean) while greater than zero is better than average and less than zero is worse than the average of the 6000 foods analysed. The nutrient density calculations are based on the USDA database which provides the nutrient content of more than 6000 foods. It does not account for species specific bioavailability or issues such as fat soluble vitamins. I don’t think we can use this to say that plant foods are better or worse than animal foods, but rather it shows us which foods to avoid due and which foods are the best choices within particular categories. Personally, I think optimal involves getting a balanced range of the most nutrient dense plant and animal based foods. So what does this data mean and how could it be practically useful? If you’re metabolically healthy then I think you’d do well eating the most nutrient dense foods on the right-hand side of the chart (i.e. celery, spinach, mushrooms, onions, oranges etc). While many of these nutrient dense foods may have a higher proportion of insulinogenic calories I think it’s hard for most people to overeat them. The foods most people should avoid are the highly insulinogenic low nutrient density foods on the top left of this plot (i.e. soft drinks, fruit juice, sport drinks etc). If you’re insulin resistant or aiming for therapeutic ketosis (e.g. as an adjunct treatment for cancer or epilepsy or dementia) you will want to move down the chart to the higher fat low insulinogenic foods while keeping to the right as much as possible. It’s important to note that the high fat foods typically have a lower nutrient density because they do not contain as broad a range of nutrients. While 60 to 70% of the western population seem to be suffering some level of metabolic syndrome and are insulin resistant some people who are metabolically healthy are still obese. For these people simply reducing the energy density without consideration of carbs or insulin load (i.e. lowering their fat intake with higher amounts of water and fibre) will help them to consume less calories. Someone who is metabolically healthy (i.e. excellent blood glucose levels etc) yet still obese would do well to focus on the nutrient dense low energy density vegetables, fruits, seafood and meat in the top right of this chart. This is basically where I’m at after normalising my glucose and HbA1c but I’d still like to drop some more weight. I now need to take my own advice and focus on more nutrient dense proteins and vegetables and indulge less on the yummy high fat foods. The typical problem with a low fat approach typically comes not from eating too much vegetables or fruit (top right of this chart) but rather when your energy comes from highly insulinogenic, energy dense low nutrient density foods (e.g. processed grains and softdrinks) which end up on the top left of all of these charts. The only real ‘problem’ with a high nutrient density low energy density approach is that it is physically difficult to get enough food down to achieve an energy surplus. The benefit is that it typically leads to weight loss while still maintaining very high levels of nutrition. A high nutrient density low energy density approach could still be ketogenic due to the low level of processed carbohydrates and low insulin load. Click here to view the interactive Tableau version of nutrient density versus energy density. Lots of people like to count carbohydrates or net carbohydrates (i.e. carbohydrates minus the indigestible fibre). In my view I think it’s better to think in terms of net carbohydrates when eating real foods to make sure you don’t miss out on nutrient dense vegetables. The chart below shows nutrient density versus net carbohydrates. Focusing on the foods on the top right and avoiding the soft drinks, cereals and breads at the bottom will be a pretty good strategy. The limitation of net carbs is that it doesn’t account for the impact of protein which is an important consideration for people with type 1 diabetes or advanced type 2 diabetes. Click here to view an interactive Tableau version of nutrient density versus net carbs. This brings us to my favourite way to look at nutrient density… insulin load. Thinking in terms of insulin load involves consideration of net carbs plus about half the protein as requiring insulin. Insulin load per 100g of food is neat because it means that we also end up with lower energy density foods as well which is not a bad thing for most people who often wouldn’t mind losing some weight (note: low energy density foods like celery may not be so great if you’re trying to fuel for a marathon). I think it’s good to also consider the insulin effect of protein because insulin is a finite resource. While people who are metabolically healthy will be able to eat high protein foods without seeing a substantial rise in their blood glucose levels, people who are very insulin resistant or have type 1 diabetes will see their glucose levels rise with protein and may need to inject insulin to cover the protein they eat. This doesn’t mean though that people who are insulin resistant should avoid high protein foods, because they are typically very nutrient dense. Again, we can see that it’s the soft drinks, breakfast cereals and breads at the bottom of this chart that we really need to be avoiding! This thinking seems to align with common sense wisdom. Tick. Click here to view an interactive version of insulin load versus nutrient density. Hopefully you can see how thinking about nutrient density graphically in combination with other parameters can be useful to refine your food selection for different goals. The appendices to this article below show more charts for different food groups with a little more discussion of my observations. Or better yet, why not dive into the interactive data in Tableau and see what you can make of it yourself. Foods with a lower proportion of insulinogenic calories can be useful for people trying to achieve therapeutic ketosis, however at the same time we can see at the bottom of this plot that high fat / low insulin load foods are not necessarily the most nutrient dense. People should ideally choose foods with the highest nutrient density (right hand side) while keeping the proportion of insulinogenic calories in their diet low enough to achieve their goals (e.g. blood glucose, insulin, tumour growth or seizure control). Click here to view the interactive Tableau version of nutrient density proportion of insulinogenic calories. Vegetables are typically have high levels of vitamins and minerals as well as some protein but not much fat. Most people, particularly those who are not severely insulin resistant, will do well to focus on the most nutrient dense vegetables on the right hand side of this chart (i.e. celery, spinach, squash, cabbage, broccoli, mushrooms, artichokes, kale) as their energy density, insulin load and net carbs are also low. Celery is an example of a food with high amounts of vitamins and minerals with a very low energy density, hence it does really well on the nutrients / calorie scale. The foods in the chart below with the lowest proportion of insulinogenic calories typically have added fat (e.g. french fries, onion rings which are not ideal) or are very high in fibre (e.g. asparagus, spinach and soybeans which is better). Seafood is really the only substantial source of essential omega 3 fatty acids (i.e. DPA, DHA, EPA, ALA) and hence is an important part of a balanced diet. The highest nutrient density seafoods are cod, anchovy, salmon, caviar and tuna. The lowest insulin load fish are mackerel, herring, salmon and caviar. Again, we should ideally focus on the most nutrient dense foods on the right hand side of the chart, but move down the chart to the least insulinogenic foods depending on our level of metabolic health. Liver is the most nutrient dense of the animal products (right hand side) while processed meats are less nutrient dense (left hand side). High fat meats are also typically less nutrient dense (bottom of chart). Non-processed meats are typically well worth the investment of your limited insulin budget. Many nuts and seeds are high fat while also being fairly nutrient dense (i.e. pine nuts, coconut and pecans). Nuts have a low proportion of insulinogenic calories and hence help to normalise blood glucose levels, but possible to overdo if weight loss is your primary goal. Some dairy products are both high fat and nutritious (e.g. parmesan cheese, egg yolk). Cream and butter are high fat and energy dense so are useful for managing blood glucose levels but are possible to overdo if weight loss is your primary goal. Low fat dairy products such as skim milk and whey are typically very nutrient poor overall. Some fruits are nutrient dense, but are typically highly insulinogenic (tangerines, cherries, grapes, apricots, oranges and figs). Only olives and avocados have a low proportion of insulinogenic calories, however they are not particularly nutrient dense. Unprocessed grains such as oatmeal, teff, spelt, brown rice and quinoa can be nutrient dense but are highly insulinogenic. Unprocessed grains may be fine if you are metabolically healthy, but choose carefully and don’t go adding sugar, honey or molasses. However breakfast cereals and most breads are typically highly insulinogenic while also having a poor nutrient density and hence are a poor investment of your limited insulin budget. This analysis supports the idea that dropping processed grains, packaged breakfast cereals and soft drinks would be a pretty good place to start for most people! Navy beans, lima beans and lentils are nutrient dense but highly insulinogenic. Peanuts, peanut butter and tofu do OK in terms of both being low insulinogenic as well as nutrient dense. Processed soy products and meat replacement products are typically highly insulinogenic and have poor nutrient density. Fish oil is the most nutritious of the fats. However as a general rule pure fats are not particularly nutrient dense. Margarines and salad dressings are very nutrient poor. Soft drinks, sports drinks and sweetened iced teas are bad news and are an extremely bad investment of your limited insulin budget. Fruit juices are not also not particularly nutrient dense. Better to eat your fruit whole. Low energy density, high nutrient density foods are a great way to lose weight, particularly for those who are insulin sensitive. As we avoid processed carbs as well as high levels of dietary fat while maintaining high levels of nutrition we can allow the fat to come from our belly rather than our plate. It’s hard to go wrong with the low energy density high nutrient density foods in the top right of this chart (i.e. celery, mushrooms, spinach, onions, broccoli, seaweed, kale etc). Some seafood is nutrient dense and lower in fat (e.g. oysters, tuna, lobster). Seafood is important because it provides the essential omega 3 fatty acids that are hard to obtain in significant amounts from vegetables and it provides higher levels of protein. If you are serious about losing weight you’d do pretty well if you limited yourself to the vegetables in the top right of the chart above and the seafood in the top right of the chart below. There are many nutrient dense low energy density animal foods as shown in the chart below. Liver does pretty well followed by game meat. Processed meats are not so good. Nut are low insulin but not necessarily low energy density or spectacularly great in terms of nutrients per calories. Consider limiting your nuts and seeds if your primary goal is weight loss. Whole egg (top right corner) is probably your best option from the dairy and egg category. Butter and full fat cheese have a high energy density (bottom). Low fat dairy is nutrient poor (top left corner)! If your goal is weight loss then low energy density fruits such as tangerines / mandarins, cherries, apricots and pears will be more helpful than energy dense fruits such as bananas, prunes, raisins and dried fruits. Some unprocessed grains are nutritious and have a low energy density (top right), however as a general rule, breakfast cereals and processed grains are a poor investment of your limited insulin budget (bottom of chart). Lima beans, navy beans, tofu, mung beans and hummus are nutrient dense and low energy density (top right). Peanuts have a low insulin load and solid nutrient density but a high energy density (bottom). Most people keeping track of their carbohydrate intake think in terms of net carbs or total carbohydrates, however this does not consider the insulin demand from protein which is a real consideration if you have diabetes. Thinking in terms of net carbs will be the best approach for most people; however, if you are highly insulin resistant or have type 1 diabetes you may be better to consider insulin load which considers the effect of protein on insulin. Choosing foods to the top right of these charts will help you keep nutrition high and net carbohydrates low. There are plenty of vegetables on the top right of this plot that have minimal net carbs while being very nutrient dense (e.g. celery, spinach, broccoli, asparagus, mushrooms). Low water foods such as mushrooms, leeks, shallots (at the bottom of the plot) will be hard to eat large quantities of although they have a higher amount of net carbs per 100g. Most seafood has minimal levels of net carbs, though it’s interesting to note that some seafoods such as oysters have a glycogen pouch depending on what time in the season they are harvested. Similar to seafood, most animal products have negligible amounts of net carbs. The amount that is contained in muscle glycogen is not significant. Liver and game meats are consistently the most nutrient dense of the animal products. Nuts and seeds have some non-fibre carbohydrates. Pine nuts, macadamias and almonds are low in carbs with moderate nutrient density. Many dairy and egg products have a high nutrient density as well as being low in net carbs which is why they are popular with low carbers. Fat free cheeses have more carbohydrates. There are some lower carb fruits however, it may be wise for people with insulin resistance to avoid many of the higher carbohydrate fruits at the bottom of this chart. This chart demonstrates why many breakfast cereals and processed grains (at the bottom of this chart with high levels of carbohydrates and minimal nutrition) are a bad investment of your limited insulin budget. This style of analysis demonstrates why the common wisdom that soft drinks and breakfast cereals are bad news. Not all legumes are created equal. Choose wisely. Navy beans, legumes, lima beans and peanuts are probably your safest bet. Soft drinks and sports drinks are a very poor investment of your limited insulin budget as they are very low in nutrients. Thinking in terms of nutrient density versus insulin load enables us to more intelligently consider how we invest our insulin budget. Again, it’s not that insulin is bad, but rather we should use it wisely for the most nutrient dense foods. Soft drinks, breakfast cereals and bread at the bottom of this chart are a poor way to invest the limited capacity of your pancreas. Don’t be afraid of vegetables. Most of them have a very low insulin load. They should take up a large amount of your plate. But choose wisely from the top corner (e.g. celery, spinach, squash cabbage, broccoli). There are lots of good investments to be made in the top right of this chart of seafood (oyster, salmon, lobster, mackerel). Animal products require insulin but they are rich in amino acids which play an important role in the body. The amount you need will be dependent on your situation and your goals (e.g. someone aiming for therapeutic ketosis will want less while someone looking to build muscle or retain muscle while dieting will want more protein). Looking at nuts in terms of insulin load rather than net carbs enables better differentiation based on how much insulin these foods will demand from your system. Pine nuts, macadamia nuts and coconut have the lowest insulin load while being nutrient dense. Dairy can be insulinogenic, however the higher fat butter, cream and egg still have a fairly low insulin load. Grapefruits, cherries, apples, grapes and oranges have a large amount of nutrition with a low insulin load versus more concentrated or dried fruit options. The breakfast cereals at the bottom of this chart with high amounts of insulin demand and lower levels of nutrients are bad news people who are insulin resistant. Lima beans, navy beans, and lentils have a fairly low insulin load and high nutrient density. However if you are insulin resistant you will need to eat to your metre and make sure your blood glucose levels don’t rise too much if you eat legumes. Just because it is low insulin doesn’t mean that it is good for you. Not many very high fat foods have substantial nutrient density. When it comes to nutrient density, fats in whole foods are a better than trying to consume refined oils. Soft drinks are bad news as they will stimulate large amounts of insulin while providing minimal amounts of nutrition and satiety. Again, thanks for the exhaustive work. the data difficult to parse. The analysis is based on the analysis of all the foods in the USDA foods database. Zero is effectively average. Greater than zero is more nutrient dense than all the foods. Less than zero is worse. Sorry about all the breads, that’s just what’s in the database. for the analysis about nutrient availability. than the iron in meat (yum). Another avenue to investigate is putting black pepper on your food this may be one of the easiest, most economical ways to boost your overall health status. Piperine, the main alkaloid from black pepper has been shown to substantially increase the bio-availability of the nutrients in foods and supplements. As the quality of food declines and the costs of food and supplements continue to skyrocket, it is increasingly important to your health that the nutrients you consume are able to be used to maximum efficiency by your body. The same holds good for adding Himalayan or a good sea salt to give a holistic approach. Yeah. We use black pepper. It’s good stuff. Marty – will you share your underlying dataset with other budding data scientists? I’d love to see someone get an even better fit to the insulin index with some extra parameters (it could be an excellent Kaggle competition), or more suggested diets grounded in the facts that you’ve tirelessly put out there. Read the article. No real content on species specific bioavailability of nutrients?!?! I actually think you can get moderate levels of B-12 on a plant based diet. It’s Vitamin D, choline and omega 3s that really suffer. Hence eggs and fish are a good options. One cannot get any proper level of B12 from plants. “What is not clear here, is that 100 calories of broccoli is FIVE CUPS, vs 3.5 ounces of beef in 100 calories. Come on folks! Broccoli is not as easily digested as meat (can you imagine how you might feel after eating that much broccoli?) and the nutrients in broccoli can’t even begin to compare to the nutrients in beef. Plus, meat is a complete protein with no limiting amino acids. The protein in meat is highly digestible… meats like beef have a score of approximately 0.9, compared with values of 0.5-0.7 for most plant foods. Also, eating more vegetables to get your nutrients may increase the amount of ingested phytonutrients to a level which may be doing damage to your body.